Brazil can overcome the problems if they invoke the spirit of 1950, believes Tim Vickery. Inspired by the idea of covering the 2014 World Cup, Danish journalist Mikkel Jensen studied Portuguese and based himself in Brazil to observe the build up to the big kick off on June 12. But in the middle of April he went back home, proclaiming that “the dream has become a nightmare.” He had come to the conclusion that the tournament was doing nothing to help the ordinary Brazilian – indeed, he felt that in some cases it was even making things worse, and he no longer wanted to be part of it. It is an understandable, coherent reaction to a flawed tournament. Jensen has looked under the rock, and what he found was not pretty. Many Brazilians share his sentiments and feel that their country has other, far more urgent priorities. The support of the local population was cynically taken for granted. At the start of the process they were told by Ricardo Teixeira, at the time president of both the CBF and the Local Organising Committee, that this was a private event, where the only public spending would be on much needed infra-structure works. It is, then, almost beyond belief that until 2012 there was no government representation on the Local Organising Committee. Fernandes acknowledges that this was “an error. Because the operational plan, security, public transport, energy, health service – all depends on the public power.” The tardy entry of the government in the LOC is one of the explanations for the delays, which have pushed up the cost of the World Cup and reduced the scope of the works, leading large parts of Brazilian society to the conclusion that they are paying too much to host the tournament and not getting back enough in return. In the light of this, the Mikkel Jensen course of action is one possible response – and many of us with some involvement in such mega-events must surely have had pangs of conscience along the way. Are we all really guilty by association? My personal position is that for all the flaws of the 2014 World Cup, there is still value to be found in the mere fact that the planet can come together in this way – and as evidence for my case, I present the example of the 1950 Final, the previous time that the tournament was held in Brazil. There will be immense pressure on the home side this June and July – but although the population of Brazil is now four times greater and the intrusive, modern 24/7 media was not yet in existence, the stakes were higher for their 1950 predecessors. The 2014 team will be representing Brazilian football. The debate about what kind of society Brazil is and could be will be raging outside the stadiums. But back in 1950 everything was taking place on the pitch. Going into the decisive game against Uruguay, Brazil were hailed by their own people as mighty world champions. Their triumph would indicate that the “land of the future” was about to arrive – and there could be no more appropriate setting than the newly-built Maracana stadium, like some giant spaceship parked just to the north of Rio de Janeiro’s city centre. So when Uruguay came from behind to win 2-1 it was felt as a crushing blow to the hopes of a nation. It was a defeat which, at the time, appeared to condemn Brazil to endless underachievement. Those on the field paid a heavy price. “I played for 19 years,” wrote Zizinho, the outstanding member of the side, on the first page of his autobiography, “I won some titles and along with the other players of that campaign I’m remembered as a loser.” His inside-forward colleague Jair spent decades worried at the prospect of someone coming at him with a knife because he lost that game. Many years later keeper Barbosa, beaten on his near post for the decisive goal, held a ceremonial burning of the Maracana goalposts. It did not bring closure. He died in 2000, still lamenting that the maximum jail-time in Brazil was 30 years, while he had served a 50-year penalty for a crime he did not commit. 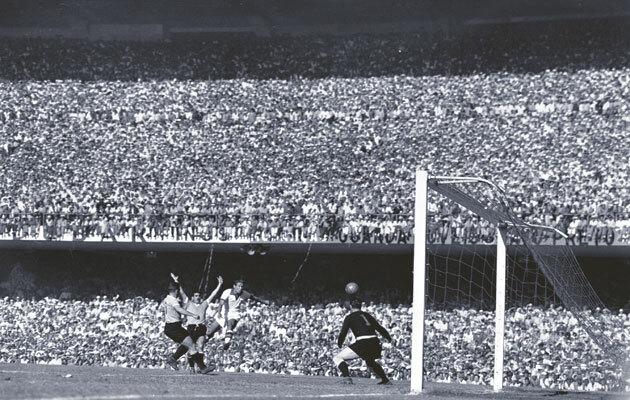 Big occasion…Brazil and Uruguay meet at the Maracana in 1950 in front of a crowd estimated to be over 200,000. But going through such a profound experience produced something other than bitterness. The match helped forge a bond between the players of Brazil and Uruguay. Nowadays, only one man survives – ironically enough, Alcides Ghiggia, the winger whose goal won the trophy for Uruguay. But while most of the players were still alive, members of the two teams would get together for reunions, or visit each other in a warm atmosphere of affection and mutual respect. This is a striking and excellent symbol of the often silent work that football does in bringing people together, giving them a common language and cementing international friendships. Sixty-four years after Brazil’s first World Cup, many more bonds will surely be established between people from different backgrounds, as supporters of 32 teams (plus the neutrals) criss-cross this giant country in search of a spectacle. Despite all the many defects, there should be much to celebrate when 736 of the best players of the global game plus hundreds of thousands of fans assemble in Brazil for the 2014 World Cup.